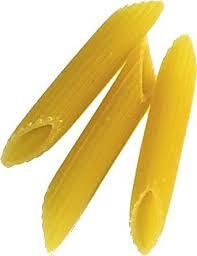 Penne is a pasta favorite and it looks like a cylinder or small short tubes with diagonally cut ends. 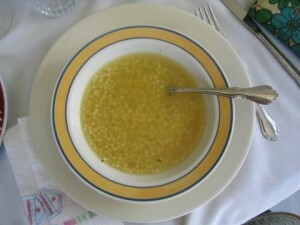 Mamma uses a Catelli brand which is made in Italy. A great recipe you might want to try with penne is pasta with stuffed tomatoes….Pasta con i pomodori. This recipes serves 6 people. Start by preheating your over to 350 deg F.
Cook penne pasta in a large pot of boiling salted water. Drain and rinse. Set aside. Going in oven later so make sure your pasta is firm or al dente. Plunge your tomatoes in boiling water for 1 minute, remove and skin. Cut tops from tomatoes. Carefully scoop out the middle or centers and discard. Sprinkle the inside of the tomatoes with seasonings and fill with equal amounts of cheddar and mozzarella cheese. Bake in oven until tomatoes are soft and the cheese is melted. Place your noodles on a large greased oven safe platter. Sprinkle with parmesan and small dot of butter. Place in oven for 5 minutes and Mangiare!! As a variation and if you have some cooked ground beef or cooked sweet Italian sausage you can add some to the inside of your tomatoes with the cheeses when stuffing. 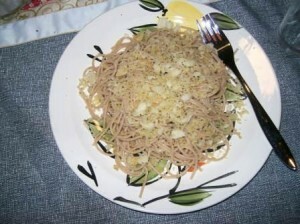 A winter classic in Mamma’s house is Pasta con molica pane or pasta with bread crumbs. 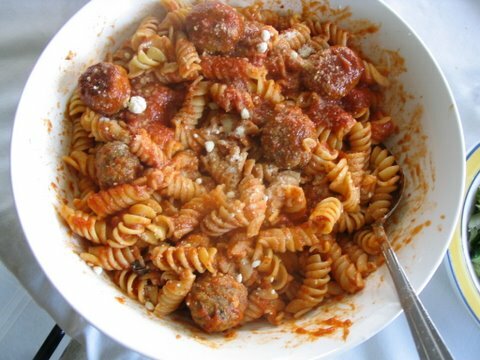 This is a super simple pasta dish which will provide you some variety if you are always serving a typical Pasta with meat sauce dish to your family. 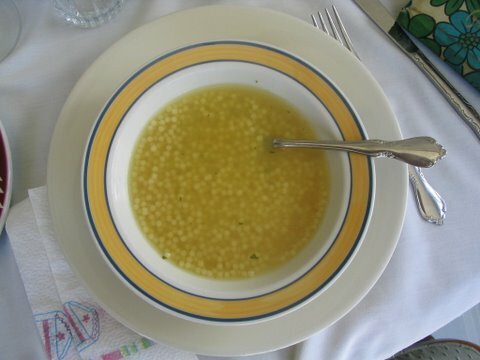 It is truly authentic to this region of Italy and it is very likely you have never heard of or tried this pasta dish before. Prepare your favorite Spaghetti… set aside. Add olive oil, 1 clove crushed garlic, add bread crumbs (insides of homemade bread…no crust). Sprinkle with parmesan cheese and eat….Mangiare. This pasta recipe takes a bit of work but if you are having a dinner party and you are wanting to WOW the crowd this Italian recipe will do just that. Place fresh spinach in large saucepan, cover and cook over moderate heat until wilted. About 4-5 minutes. Drain and cool. When cool squeeze dry and chop fine. With a large skillet on moderate heat cook the 8 ounces of Italian sausage (remove casings first), until brown or about 5 minutes. To reduce grease use a slotted spoon to place the meat onto a plate with paper towel. Cool and chop fine. Using same skillet saute 1 small finely chopped onion, 1 clove garlic (minced). Stir frequently for about 5 minutes. Using a large bowl combine onion mixture, sausage, spinach, 1/2 cup parmesan cheese, 1 cup mozzarella, 1 cup ricotta cheese, 1 egg, 1 tbsp minced parsley, 1/2 tsp oregano, 1/2 tsp black pepper. Cook pasta as per package instructions…do not overcook. Drain off about half of the water and refill the pot with cold water. Remove shells and place on kitchen towel. Preheat oven 375 deg F.
Spread tomato sauce over bottom of shallow 2 quart casserole dish. Stuff pasta shells with sausage and spinach mixture and place them on the sauce. Spoon remaining (2 cups) of sauce overall and sprinkle with rest of parmesan cheese (1/2 cup). Mix well and shape into meatballs. Preheat oven to 350 deg F and cook meatballs for 15-20 minutes or until brown… Mangiare and Let Mamma Feed You! 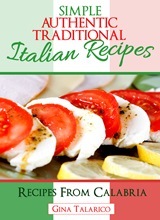 Looking for a classic Italian recipe for homemade pasta sauce or tomato sauce from scratch? Add 1/2 cup of olive oil and clove of garlic to cooking pot. Start simmer on low temperature. Add tomatoes. Option 1 – Drop tomatoes into boiling water for 1/2 minute or 30 seconds. Remove and peel skin. Place the peeled tomatoes into your cooking pot and crush. Option 2 – If you have a blender or bullet mixer you do not need to peel or boil the tomatoes. Remove core, cut the tomatoes in half and blend. Add the mixture to your cooking pot. Add basil, oregano and salt. Simmer for 3-4 hours. Mangia!! For meat sauce add cooked lean ground beef.